Born in Stockholm in 1923, Erland Josephson is actor, author, director and scriptwriter. He managed the Royal Dramatic Theater in Stockholm from 1966 to 1975. 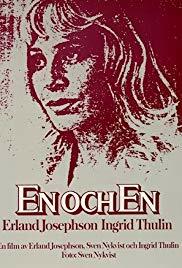 « En Och En » was his first feature film as director. Born in 1922 in the south of Sweden of Lutherian missionary parents who spent most of their lives in Africa, he studied photography at the Stockholm Municipal School for Photographers. From 1941 to 1959, he worked as cinematographer’s assistant at the Sandrew Studios and then as cinematographer at Rome’s Cinecitta. He worked on several documentaries in Africa, and on almost 40 feature films when he became Ingmar Bergman’s cinematographer. He worked as well with numerous international directors.